I never realized how many of you were history buffs, or at least wanted to be history buffs. However, one of the most requested articles I’ve received was a piece on the origins and history of the crossbow. I’ve always been a bit of a history geek, so I already knew some of this. However, to make this as comprehensive as I could, I spent several weeks in deep research looking for everything I could find on the history of this powerful weapon. First, let’s talk about the crossbow itself. This is a weapon based on the bow, featuring a horizontal bow-like assembly called a prod, which is then mounted on a stock. It shoots projectiles that are sometimes called bolts or quarrels. During medieval times, the crossbow was called by many names, most of which were derived from the word “ballista,” a torsion siege engine that looks quite a bit like a crossbow. As you’ll learn later on in this history, the crossbow caused quite a shift in the role of projectile weaponry, because the traditional archer required a considerable degree of lifetime training, physical strength, and expertise in order to operate a bow with any degree of accuracy and efficiency. In quite a few cultures, archers were drawn from the common class, but were considered a separate and superior caste because their archery skillset was developed from birth and was impossible to recreate in any other way. It was only the pre-established cultural tradition, which many nations lacked, that allowed a country’s military force to field a respectable team of archers. The crossbow, on the other hand, was simple, cheap, and physically undemanding enough for even the lowliest conscripted soldier to use. Virtually any nation could enter the field of projectile weaponry using a crossbow, because adequate training on the weapon could be accomplished in a matter of weeks, instead of the years required for a bowman. We don’t know exactly who invented the handheld crossbow, but we know that it originated in East Asia. 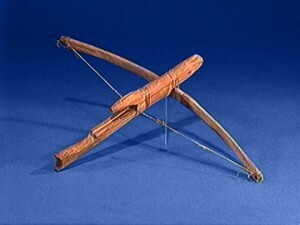 The earliest evidence of crossbows in ancient China and neighboring territories points to at least the 6th Century BC, and Sir Joseph Needham states in his Science and Civilisation in China that it is not possible to determine precisely which of the East Asian peoples invented the weapon. If you look at the linguistic origins of the word, it derives from outside China by their then neighbors, who were often hired as marksmen mercenaries. In spite of that, most of the evidence in terms of records and finds of crossbow remains are from China itself. Textual evidence of crossbows also dates back pretty far. 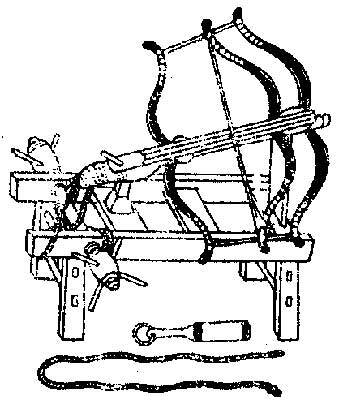 The earliest Chinese document mentioning the crossbow is found in scripts from the 4th to 3rd Centuries BC, attributed to the followers of Mozi. This particular reference makes mention of the use of a giant crossbow in the 6th to 5th Centuries BC, which is right around the late Spring and Autumn Period. Furthermore, Sun Tzu’s book The Art of War, which first appeared between 500 BC and 300 BC (James Clavell, The Art of War, prelude), makes several references to the crossbow. For example, Sun Tzu writes, “Energy may be likened to the bending of a crossbow; decision, to the releasing of the trigger.” He refers in chapter V to the traits of the weapon, and in chapter XII to the use of the crossbow in warfare. Additionally, there is undoubted evidence that the weapon was used for military purposes during the Warring States period in the second half of the 4th Century BC and onwards. Let’s talk about crossbow-related finds. 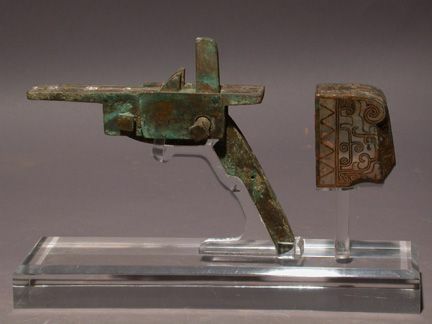 Archaeologists have located bronze crossbow bolts that date back as early as the mid–5th Century BC in Yutaishan, Hubei, and a Kingdom of Chu burial site. On top of that, we’ve found early handheld crossbow stocks with bronze triggers dating from the 6th Century BC. Those have been found in Tombs 3 and 12 at Qufu, Shandong, which was the capital of the State of Lu. Archaeologists have also located crossbows in Tomb 138 at Saobatang, Hunan, and have dated them back to the mid–4th Century BC. 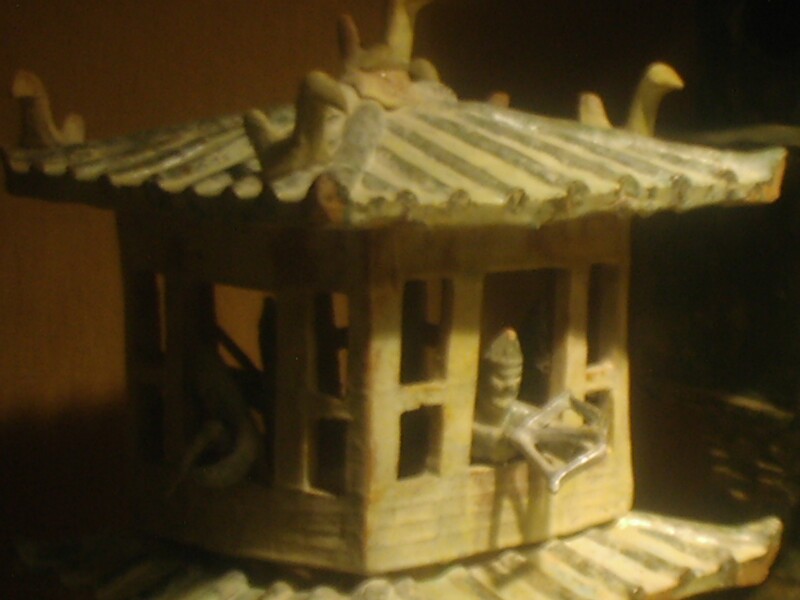 First mentioned in the Records of the Three Kingdoms, Tomb 47 at Qinjiazui, Hubei is dated to around the 4th Century BC, and housed repeating crossbows. This is where the controvery sparks up, because some historians attribute the design of the repeating crossbow to a famous military advisor named Zhuge Liang (181–234 AD). At a minimum, Zhuge Liang improved the design of the repeating crossbow and made a version that shot two to three bolts at once, and was used in massed formations. The Zhuge crossbows, also referred to as the Chu-ko-nu or lián nǔ, were crossbows where the separate actions of stringing the crossbow, placing the bolt in the rail, and then firing the crossbow could be accomplished with a simple one-handed motion while keeping the crossbow itself perfectly stationary. 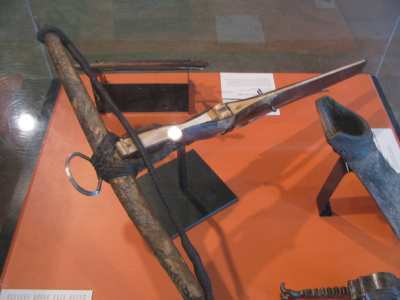 Allowing for a higher rate of fire than a normal crossbow, the Zhuge crossbow utilized a bolt-containing magazine on top of the bow with a rectangular lever moved forward and backward to work the mechanism. Pushing and pulling the lever back and forth would simultaneously drop a bolt into place, pull the string back, and release the bolt. Such action put quite a bit of wear on the string, unfortunately. The bow string for the Zhuge crossbow consisted of animal sinew twisted into a cord of suitable strength, often reinforced with quills from bird feathers, preferably from swans or ducks. Wondering what the range was of these early crossbows? The Chinese repeating crossbow had a range of approximately 360 feet, and an effective range of 260 feet. If you’re curious about records of the crossbow being used in warfare, the earliest reliable records of that nature refer to an ambush, the Battle of Ma-Ling, in 341 BC. Within 150 years of that battle, by the 200s BC, the crossbow was very well developed and widely used for warfare and hunting in China. 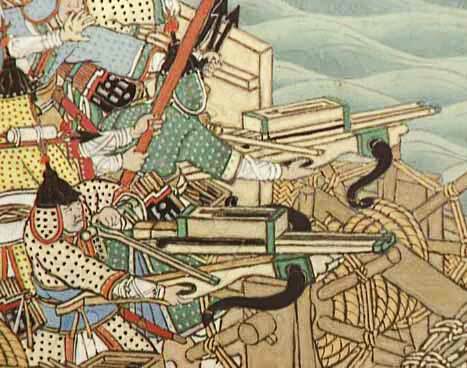 Of course, many of these references are to giant crossbows, but even the handheld crossbow was in early use in China and other parts of East Asia. Dating back to the 4th Century BC, handheld crossbow usage can be found in textual records. As far as archaeological finds go, the Terracotta Army buried in the tomb of Qin Shihuang from roughly 221–210 BC were discovered to have handheld crossbows with complex bronze trigger mechanisms. The subsequent Han Dynasty (202 BC to 220 AD) had specimens similar to those found on the Terracotta Army, and the crossbowmen described in the Qin and Han dynasty learned drill formations and were even mounted as cavalry units. Writers during the Han Dynasty attributed much of the success in battles against the Xiongnu to massed crossbow volleys. We don’t just find record of crossbows in China, either. According to Vietnamese historical legend, ruler and general Thục Phán, who reigned over the ancient kingdom of Âu Lạc from 257 to 207 BC, was said to have possessed a magical crossbow capable of shooting thousands of bolts at once, and that weapon was said to be the reason Thục Phán was so powerful. The repeating crossbow was introduced to Korea by King Sejong (1418–1450), who saw the weapon and was impressed by its mechanism during a trip to China. 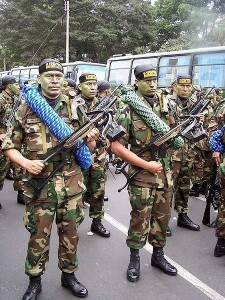 In Korea, the weapon was called sunogung. The latest use of the crossbow in East Asia, or at least the repeating crossbow, was as late as the Sino-Japanese war of 1894 to 1895. Photographs from that war show repeating crossbows as common weapons among Qing Dynasty troops. After that period, the crossbow quickly fell out of fashion as other firearms proved more accurate and had greater range and capabilities in battle. 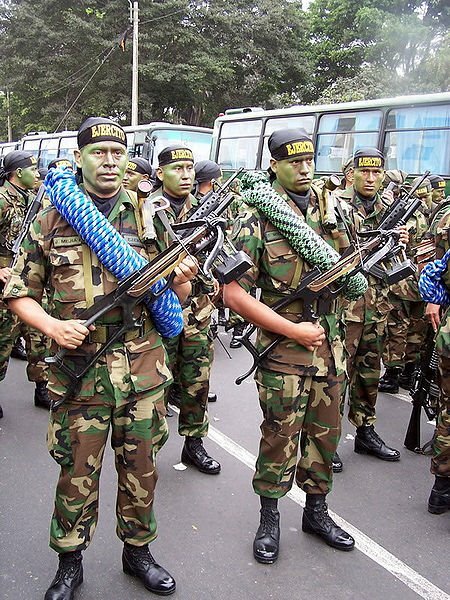 We don’t just find the use of the crossbow in East Asia. 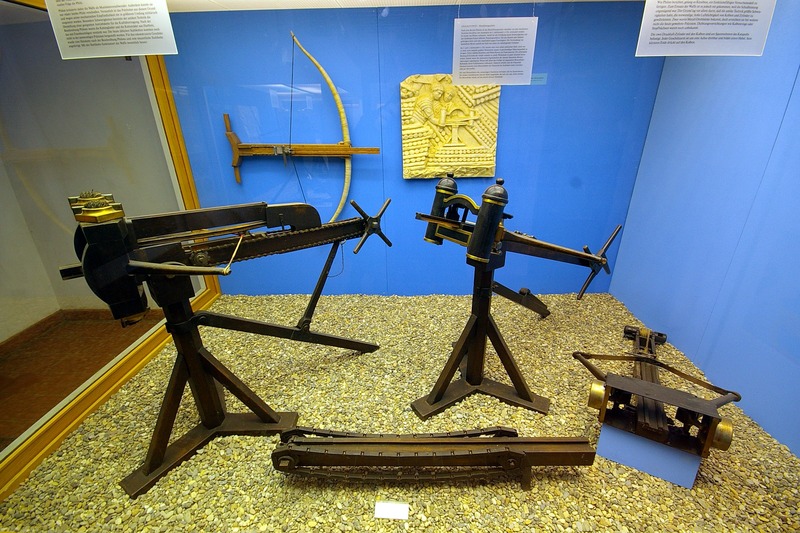 Europe also utilized crossbows early on, with the earliest reasonbly reliable date pointing to sometime during the 5th Century BC in ancient Greece. 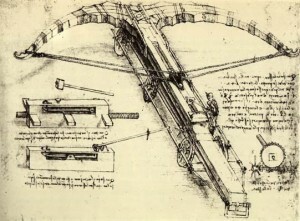 Greek historian Diodorus Siculus describes the invention of a mechanical arrow-shooting catapult, called a katapeltikon, used by a Greek task force in 399 BC. This would have been a large siege machine, used to tear down the defenses of a city or town in preparation for invasion. 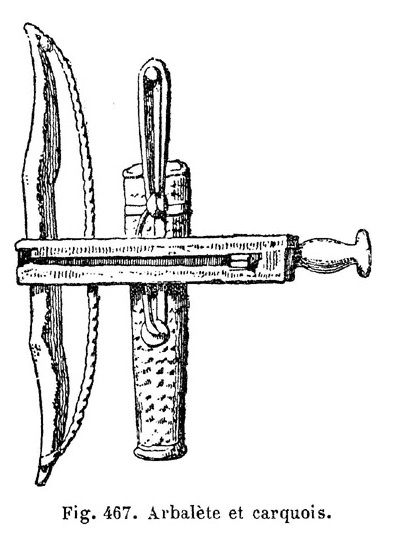 According to inventor Heron of Alexandria, that siege machine was actually inspired by an earlier handheld crossbow called a gastraphetes, or “belly shooter.” Referring to the now-lost works of 3rd Century BC engineer Ctesibius, Heron points out that the gastraphetes could store more energy than Greek bows. He provides a detailed description of the weapon, along with a drawing, in his technical treatise Belopoeica. The gastraphetes was powered by a composite bow, and was cocked by resting the stomach in a concavity at the rear of the stock and pressing down with all of the archer’s strength. This is quite unlike the later Roman and medieval crossbows, and utilized an elaborate slider mechanism to span the weapon. This weapon is believed to have been quite heavy, and required the use of a prop of some sort to keep it standing. It might have been mounted on a defensive wall or held up using a portable prop such as an early monopod. In siege warfare, larger versions of gastraphetes called oxybeles were commonly used. Later, these would be supplanted by the early ballistae that would also develop into smaller versions to replace even the gastraphetes. Even more advanced forms of the gastraphetes are described by a third Greek author, Biton from the 2nd Century BC. Biton credits an engineer from southern Italy, Zopyros, to the design of bow-machines for the sieges of Cumae and Milet between 421 BC and 401 BC. These bows featured a winched pull-back system, and were capable of throwing two projectiles at the same time. 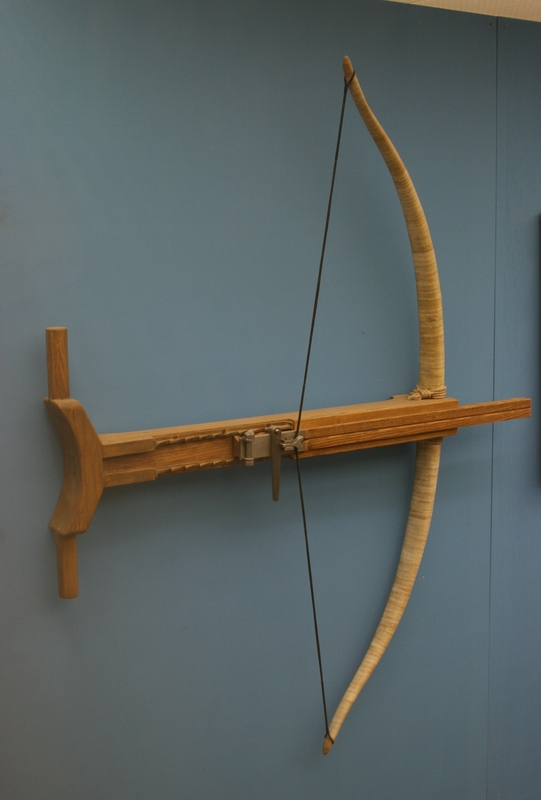 From the mid–4th Century BC forward, we see more dense and varied evidence of the Greeks using crossbows. 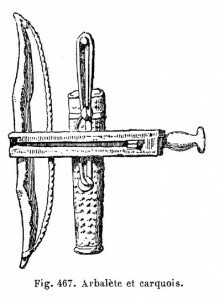 Katapeltai, arrow-shooting machines, are mentioned in Aeneas Tacticus’s treatise on siegecraft. This text was written around 350 BC, and an Athenian inventory from 330 to 329 BC includes catapult bolts with heads and flights. Philip II’s siege of Perinthose in Thrace during 340 BC apparently utilized arrow-shooting machines, as well, and Greek fortifications in places like Aigosthena began to be built with high towers with shuttered windows in the top, we believe used to house anti-personnel arrow shooters. It’s worth noting that the most commonly imagined siege warcraft machine, the torsion catapult, did not come to fruition until between 338 and 326 BC. You might picture the catapult rather than the crossbow as being the earliest siege machine, but historical and archaelogical evidence points towards crossbows, both large and small, being utilized long before the stone-throwing catapult came to be. Even with the advent of the catapult, the crossbow did not merely fade away. Instead, its concepts were used in designing the ballista, which would later hold an important role in the rise of the Roman Empire. 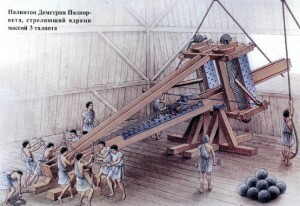 The ballista was later inherited by the Roman Empire, as the devices had spread to several city-states prior to the Greek absorption into the Roman republic. Authors like Vegetius repeatedly mention the use of arrow shooting weapons like arcuballista and manuballista, also known as cheiroballistra., which were smaller versions of the siege machine. Most scholars agree that at least one of these terms refers to handheld mechanical weapons, but they aren’t sure whether the devices were flexion bows or torsion powered, like the recent Xanten find of remainders of manuballista. The metal object found was relatively small and was the clamping frame of the weapon. The manuballista itself was believed to be made entirely of iron, which would give it greater power, but reports vary as to whether it was always made of metal or not. 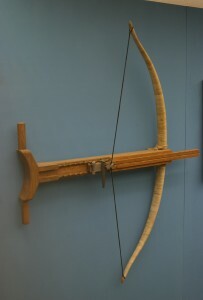 Instead of using a prod (the bow part of a modern crossbow), the manuballista appears to have used torsion springs consisting of several loops of twisted skeins. The action of pulling the bow arms and string back to store energy in the string, though, remained the same; only the mechanism of spanning the weapon changed. The Roman commander Arrian (c. 86 – after 146 AD) kept a detailed history of the training regimens for his troops. In his Tactica, he records training Roman cavalry for shooting some mechanical handheld weapon from horseback. 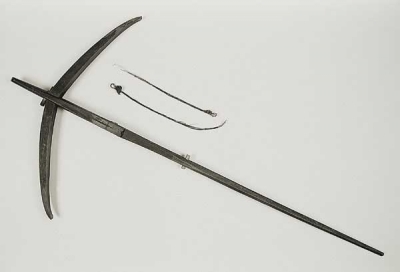 It is widely believed these weapons were similar to the medieval crossbow. 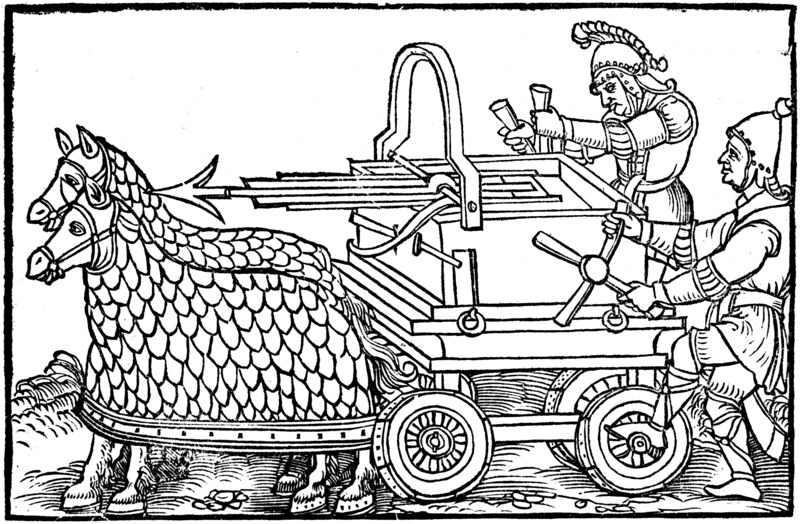 A four-wheeled ballista drawn by armored horses, from an engraving illustrating a 1552 edition of De Rebus Bellicis. 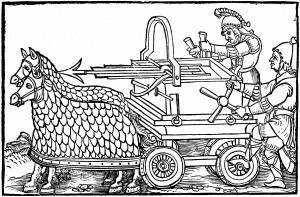 The Roman Empire also utilized the carroballista, a cart-mounted version of the weapon. Findings and reliefs of at least two different two-wheeled models and one model with four wheels have been identified, courtesy of the anonymously written De Rebus Bellicis (“On the Thing of Wars”). The probable size of the carroballista was 4.83 feet in width, and the cart system and structure would have given the weapon much greater flexibility and capability on the battlefield. There is also speculation that the Roman military may have utilized a repeating ballista known as a polybolos. While no examples of such a weapon have ever been found by archaeologists, enough textual evidence exists that a BBC documentary, What the Romans Did For Us, was able to reconstruct and test a polybolos that could shoot up to 11 bolts each minute, almost four times the rate of fire of an ordinary ballista. As the Roman Empire began its decline, the resources needed to build and maintain ballistae became scarce. As a result, the use of the siege weapon and its handheld counterparts began to drop in favor of the simpler and cheaper onager and the more efficient springald. 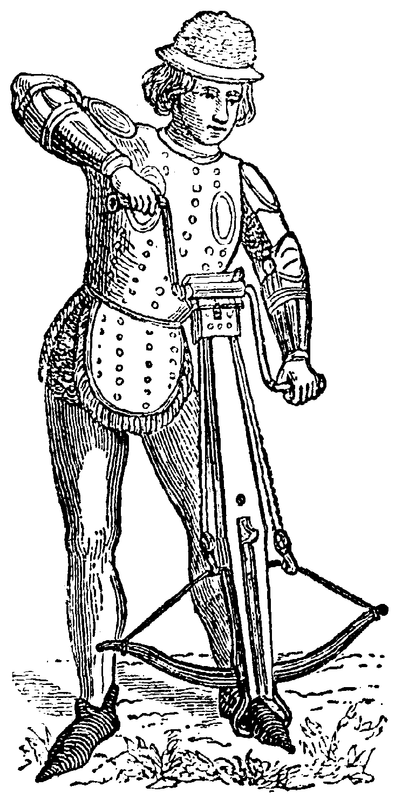 The springald was similar to a ballista, but used inward swinging arms. During the Middle Ages, the ballista continued to be used but the trebuchet and mangonel were more popular. As we will learn, the crossbow came to light as a sniper weapon during these times, and sculptural reliefs from Roman Gaul show the use of crossbows in hunting scenes. The weapons depicted in these reliefs show remarkable similarity to the later medieval crossbow, and may have been the forerunners to the hunting and warfare tools. With the heavy influence of the Roman Empire on the rest of Europe, it is little surprise that the crossbow was transmitted across Europe. It is portrayed as a hunting weapon on four Pictish stones from 6th to 9th Century Scotland, and the use of crossbows in European warfare was evident from the Battle of Hastings in 1066 until about the year 1500. A remarkable resemblance between the handheld crossbows used in Roman Gaul and Europe of the Middle Ages leads us to believe that the European crossbow was likely the evolution of the Greek and Roman war machines such as the arcuballistae. Again, this is not surprising, because the Roman Empire had a heavy influence on what would become medieval Europe. From approximately the 5th Century AD until AD 947, the crossbow appears to have faded from use. Little, if any, textual or archaeological evidence of the weapon has been found from that period. It was not until the sieges at Senlis (947) and Verdun (985) that evidence of the use of crossbows resurfaced. While the use of crossbows was evident in Scotland and the rest of Europe early in medieval history, England continued to favor the longbow for many centuries. In fact, Payne-Gallwey speculates that it was not until the Norman invasion of 1066 that the crossbow arose in use in England. 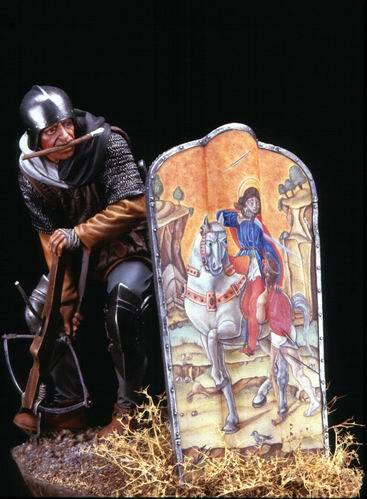 16th Century French mounted crossbowman. Image credit: Encyclopedie Larousse Illustree 1898. By the 12th Century, most of the European armies were using crossbows almost exclusively. While the longbow had greater range and penetration than a crossbow, along with faster shooting, the training necessary to achieve comparable accuracy and deadliness with the longbow took years of practice. By way of contrast, the crossbow could be effectively used after just a week of training. Eventually, the Roman Catholic Church would ban the use of the crossbow altogether in warfare. The reason for this ban was largely that of maintaining the social stratification rampant throughout Europe; the crossbow allowed any lowly peasant to kill a high-born mounted knight with little or no training, and this was seen as a serious threat to the power of the social elite. Deadliness and accuracy with a longbow came only after years, sometimes a lifetime, of training. Any ranged weapon that could achieve the same level of deadliness with as little training as required for the crossbow was seen as a threat, and elites feared the crossbow would shatter their idea of the natural order of society. As a result, they called on the Roman Catholic Church to ban the weapon, and Pope Urban II instated the prohibition in 1096. In 1139, Pope Innocent II upheld the ban, but with some equivocation. It became acceptable for Crusader armies to use the crossbow against non-believers, heretics, and heathens, but never in Christian-on-Christian combat. Pope Innocent II wrote, “We prohibit under anathema that murderous art of crossbowmen and archers, which is hateful to God, to be employed against Christians and Catholics from now on.” Violating the decree could lead to excommunication or even damnation of the soul to Hell. With the permission of the Vatican, the crossbow featured heavily in Crusader armies. Of course, the Roman Catholic Church’s ban on the weapon was not entirely successful, and many armies proceeded to violate the prohibition. In fact, Richard the Lionheart died of a crossbow wound on the battlefield in 1199. 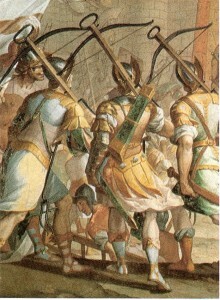 The crossbowmen from the Italian city-state of Genoa were legendary for their mastery of the weapon. Frequently, Geonese crossbowmen were employed as mercenaries by the English and French, among others, and it is in a battle involving these soldiers-for-hire that we see crossbows once again playing a major role. The mercenaries from Genoa decimated the forces of Emperor Frederick II at the Battle of Parma in 1248. Fresco by Lazzaro Tavarone at the Palazzo Cattaneo Adorno, depicting the crossbowmen of Genoa during the storming of Jerusalem. The Holy Roman Emperor was so frustrated and angry with the powerful Genoese crossbowmen that he reportedly ordered his men to cut off the fingers of any crossbow archers captured in battle. During the Battle of Crecy in 1346, a rainstorm rendered the bowstrings of the 5,000 Genoese crossbowmen hired by France soggy and useless. The English longbow archers, on the other hand, remained unphased by the damp weather. Longbow archers were able to simply unstring their bows and tuck the strings beneath their caps to keep them dry. This was a task not easily done with a crossbow, and many Genoese crossbowmen lacked the tools or training to unstring their weapons. Once the rain stopped, the English restrung their bows and rained volley after volley on the now-defenseless Italian mercenaries and French forces. In the face of this relentless assault, the Genoese merceneraries broke ranks and fled from the battlefield. It is ironic today, with all of the fun poked at the French about retreating, that the French employers of these Genoese mercenaries labeled the crossbowmen as cowards. 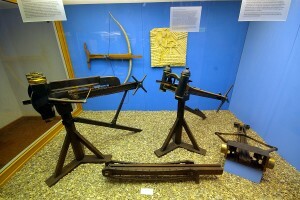 Crossbows continued to take a prominent role on the battlefield of European nations other than England. By the twelfth century, in fact, the use of the crossbow had superceded the use of hand bows, because the crossbow could be used effectively after just a week of training, compared to the years of practice required to achieve the same single-shot skill with the longbow. Later crossbows, sometimes referred to as arbalests, utilized all-steel prods. These had power close and sometimes exceeding that of longbows, but were more expensive to manufacture and slower to reload. These crossbows required a mechanical device to draw back the string, usually a cranequin or windlass. As a result, such crossbows could only fire two bolts per minute, compared to twelve or more arrows from a skilled archer with a longbow, and the operator of the crossbow required protection from enemy fire. Typically, a crossbowman was equipped with a pavise, a large convex shield that could protect the entire body. The crossbowmen would shelter behind their pavises until they were ready to attack, and the emerge from their protection and rain their deadly bolts down on the enemy. 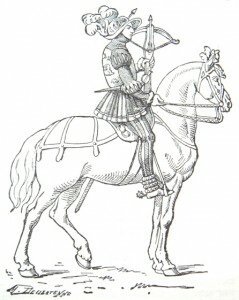 In European armies, including those of Spain, France, and Italy, mounted and unmounted crossbowmen would be mixed with slingers, javeliners, and archers as a central position in battle formations. These ranged soldiers would engage the enemy in an offensive skirmish before an assault of mounted knights, and the crossbowmen were also instrumental in protecting against counterattacks on the infantry. European crossbowmen were held in such high esteem that they often received higher pay rates than any of the army’s other footsoldiers, and the rank of commanding officer of the crossbowmen corps was considered one of the highest positions of many medieval armies. In Spain, for instance, crossbowmen were held in such high regard that their status was on par with the knightly class. 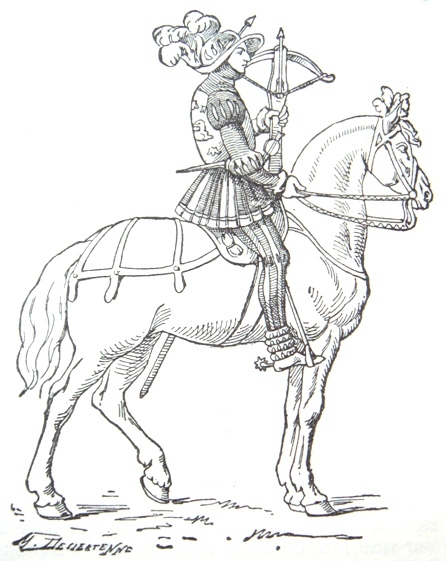 Insurgent forces, including Taborite peasants fighting for their freedom and lives during the 15th Century, quite often used the crossbow alongside polearm weapons made from farming equipment. The crossbow also played an important role in anti-personnel defense of ships, and the Genoese crossbow-wielding mercenaries remained in high regard throughout medieval times. 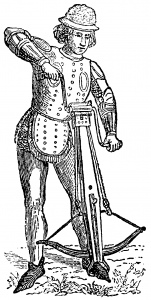 By 1525, the military crossbow had largely faded out of service in favor of firearms. 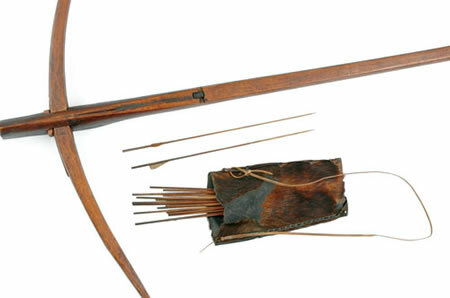 Still, the sporting crossbow remained a popular hunting weapon in Europe up until the 18th Century. A bomb-throwing crossbow reentered military service during World War I, throwing an F1 grenade or Mills bomb 120 to 150 yards. Called the Sautérelle, this weapon was utilized by both the French and British forces on the Western Front. There is some mention of the crossbow being used during Biblical times, as described above. The weapon has also been mentioned in conjunction with several other battles in Middle Eastern nations, but did not enter heavy usage until the Crusades. During the Crusades, the crossbow saw heavy usage against the Muslims. Anna Commena, daughter of the Byzantium emperor Alexius I, wrote in The Alexiad of seeing such weapons in action. One variant she describes was the tzagran, which Commena described being quite unlike the form used by the Greeks. But Marianus, speaking in their language, advised the Latins to have no fear, and not to fight against fellow-Christians. But one of the Latins hit his helmet with his cross-bow. This cross-bow is a bow of the barbarians quite unknown to the Greeks; and it is not stretched by the right hand pulling the string whilst the left pulls the bow in a contrary direction, but he who stretches this warlike and very far-shooting weapon must lie, one might say, almost on his back and apply both feet strongly against the semicircle of the bow and with his two hands pull the string with all his might in the contrary direction. In the middle of the string is a socket, a cylindrical kind of cup fitted to the string itself, and about as long as an arrow of considerable size which reaches from the string to the very middle of the bow; and through this arrows of many sorts are shot out. A very powerful weapon, it was described as being an invention of the devil, because of its ability to penetrate armor and, likely, its prohibition by the Catholic church. The crossbow entered more extensive use in the Middle East during the Crusades, as the weapon was used with remarkable success against Arab and Turkic horsemen. The Saracens referred to the weapon as the qaws Ferengi, or “Frankish bow.” Adapted by the Islamic armies in defense of their castles, the weapons were made of yew and olive, and used either with or without stirrups. Spanning was typically undertaken with a two-hooked claw known as a khattaf, and a lock mechanism using an ut, or jawzah. A footstrapped version of the crossbow became quite popular among the Muslim armies in Iberia. The crossbow was used for hunting and as a scouting weapon, from what we have been able to gather. According to Henry Balfour, crossbows were present in West Africa as early as 1861, as Paul du Chaillu described the use of the weapon against the Ba-fan in that year and brought home specimens. Unfortunately, du Chaillu does not speculate as to whether the weapons were indigenous to the peoples there or adapted from European weapons. Sir Richard F. Burton, on the other hand, wrote regarding the nayin, the native name of the crossbow among the Mpongwe of the lower Gaboon, as “peculiar to this people and probably a native invention, not borrowed, as might be supposed, from Europe” (The Origin of West African Crossbows, Henry Balfour, 1910). Balfour goes on to describe the prevalence of crossbows among the Fan and Mpongwe tribes of the Gaboon and Ogowe Rivers, including the specimens brought back to the Pitt Rivers collection at Oxford. These specimens consist of a short and very rigid bow, 25.5 inches across the arc and having a nearly rectangular section. Stout at the center and tapering towards the ends, the bow is not straight when unstrung, as most crossbows of the period were. Instead, it has a set curve when set free from strain and is set symmetrically through a rectangular hole near the fore end of a slender wooden stock 50.75 inches long. The bow is then fixed with wedges. The stock of this crossbow is split laterally for most of its length, forming an upper and lower limb. The rear ends of the stock are free and can be forced apart, remaining united in the solid front of the stock. When the two limbs are brought together, a square-sectioned peg is fixed to the lower limb and then passes upwards through the upper limb; it completely fills up a notch made on the upper surface behind the bowstring. When the string is drawn, to its maximum 3.5 inch draw length, the bowstring is held in the notch and the peg is forced downwards, which in turn causes the two limbs to separate. Firing the crossbow is accomplished by squeezing the two limbs back together; the peg forces out the bowstring when it rises into the notch, and the arrow is fired at its target. Balfour writes of J. A. Grant’s descriptions of toy crossbows seen in 1861 among the children at Ukuni in the Unyamweze country south of the Victoria Nyanza, as well as Torday’s discovery of another toy crossbow in the southern Ba-Mbala of the Kwilu district in the Kongo State. Furthermore, Balfour notes, Sir H. H. Jonston mentions the use of toy crossbows among the Ba-Yaka and Ba-Kongo people. There is not nearly as much research on the arrival of the crossbow in North and South America, but it is likely a reflection of both the European ancestry of early immigrants to the Americas as well as the transport of West African slaves to the countries. While not commonly used, the crossbow was used in the American South for hunting and warfare when firearms and gunpowder were unavailable due to economic hardships or isolation. The Inuit, found in the extreme northern parts of North America, were known to use light hunting crossbows by tradition. You might think that the crossbow has been relegated to just a hunting weapon nowadays, but that’s not the case. Various militaries, tribal forces, and even police forces in China still use the crossbow. Since the worldwide distribution of crossbows doesn’t have any restrictions or regulations, as is the case with firearms, the weapon is used as silent weapons and for their psychological effect. Notably, Serbian forces were supplied with crossbows from British-based Barnett International. They were used in ambush and anti-sniper operations against the Kosovo Liberation Army during the Kosovo War, which ended in 1999. Sometimes, they are even used with poisoned projectiles, and the crossbow is commonly used for ambush and anti-sniper offenses. Finally, crossbows are sometimes used in conjunction with ropes to establish zip-lines in difficult terrain. In closing, the crossbow has a long history of use both as a tool for hunting and as a weapon for military use. 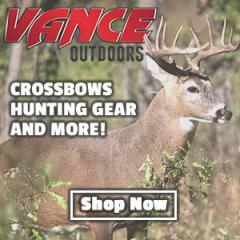 You may think that the crossbow today is purely for recreational use and hunting, but the fact is that this ancient weapon maintains a strong place in military and law enforcement, owing to its easy learning curve and its extreme accuracy.